Situé en Languedoc-Roussillon rural, le village de Castelnau d'Aude (pop. 445) est calme et paisible, un petit hameau presque un monde en dehors de l'agitation de la vie en ville. Notre maison de vacances confortable a du charme du vieux monde et équipements modernes, sans les distractions de wi-fi et la télévision par satellite. Nous invitons nos clients à débrancher et se détendre - se détendre et profiter de la simplicité de la campagne française. Optez pour un cycle par le canal (moins d'un mile de distance), un pique-nique au bord du fleuve, ou déguster un verre de vin de notre vigneron sur notre toit-terrasse. Castelnau d'Aude est situé à mi-chemin entre les villes historiques de Carcassonne et Narbonne, dans l'ombre des montagnes noires et entouré de vignobles. La maison est à seulement 5 minutes du Canal du Midi et à 30 minutes de la Méditerranée. Un paradis rural, le village reste à découvrir par beaucoup de l'extérieur de la région. Le village est connu pour son attribution gagnante cave Terres Georges dirigé par Roland et Anne-Marie Coustal qui offrent des visites et dégustations deux fois par semaine. Lezignan-Corbieres (10 minutes) a une foule de magasins, supermarchés, bars et restaurants. Les deux Lezignan et Olonzac (10 minutes) ont authentiques, marchés hebdomadaires animés. A cinq minutes en voiture se trouve le beau village au bord du canal de Homps, avec un lac de loisirs idéal pour bronzer et nager. Il dispose également d'un café-bar sur le site de location de bateau aussi. Le long du canal au Homps il ya quelques merveilleux cafés / bars et restaurants. Le rez de chaussée de la maison se compose d'un salon avec cuisine ouverte et salle à manger (avec une avec une reine canapé-lit). Le salon dispose d'une télévision pour jouer dvd. Les escaliers en colimaçon mène au premier étage avec une petite chambre simple, une grande chambre avec un lit double et de la reine, et d'un côté w / c avec douche. A l'étage il ya une grande chambre qui donne sur le toit-terrasse, une salle de endroit idéal ou se détendre avec un verre de vin sur une belle soirée chaude. La maison est située dans une rue calme avec peu ou pas de trafic. Le village a une mairie, école, bureau de poste, épicerie, ainsi qu'un bouchers van hebdomadaire. A deux minutes à pied de la maison est un terrain de jeux, terrain de basket et un stade de football. La propriétaire ne parlant pas français,une partie des messages étaient incompréhensibles....Malgré sa bonne volonté visible,je pense que c' est à cause du traducteur! La maison sentait le renfermé. Par contre les draps étaient propre,les lits fait(Sauf pour bébé),et les matelas confortables. Nous ñ'avions pas réalisé que l' église étant proche de la maison,nous avons été réveillé toute les heures par les cloches. De plus nous entendions beaucoup les voisins d'en face jusqu'à 23h environ. Nous avons préféré écourter Notre séjour et repartir le lendemain matin. Cette location convient parfaitement pour des couples avec grands enfants appréciant la vie au coeur du village,calme mais sonore. Very sorry to hear about this experience. The village is very old and quaint, and the houses very close together. It’s hard to control outside influences such as sounds, but generally the neighbors/ village is very quiet. Regarding my French ability, the guest is correct that I was using a translation tool at the time that she contacted me. As I live in another time zone and was not in the most ideal setting when I received the call, I had to resort to a translator which unfortunately was not helpful to the guest. For that I truly do apologize. Our normal caretaker was unfortunately on holiday and we had a replacement, who sadly was not helpful. I know it’s difficult to travel with small children, as I have been bringing my two children to the village since they were babies. Sincere apologies that your experience was not pleasant. We stayed in this home for 14 days in July 2018. The house is well equipped and we had everything we needed. The neighbors are very friendly. We travelled with our 4 children from 7 to 14 years old and everyone of us enjoyed our stay. The terrace on the rooftop was a great place to have breakfast and dinner and do some table games in the evening. The location of this house is very good. You can reach so many important places of this area in 30-60 minutes by car (i.e. Narbonne, Minerve, Carcassonne, Montpellier, Perpignon, Abbey Fontfroide) and also the sea is reached in 40 minutes by car. The lake in Homps is also a nice place to go swimming, and it’s only 10 minutes to drive. The Canal du Midi is just 2 km away from this home and so you can easily reach it by foot and have a nice walk along the canal. We really had a great stay! I’m so glad that you had a lovely stay at our home. We would be happy to have you back again in future. Thank you for the wonderful review. My family and I stayed in this home for six nights in August 2016. 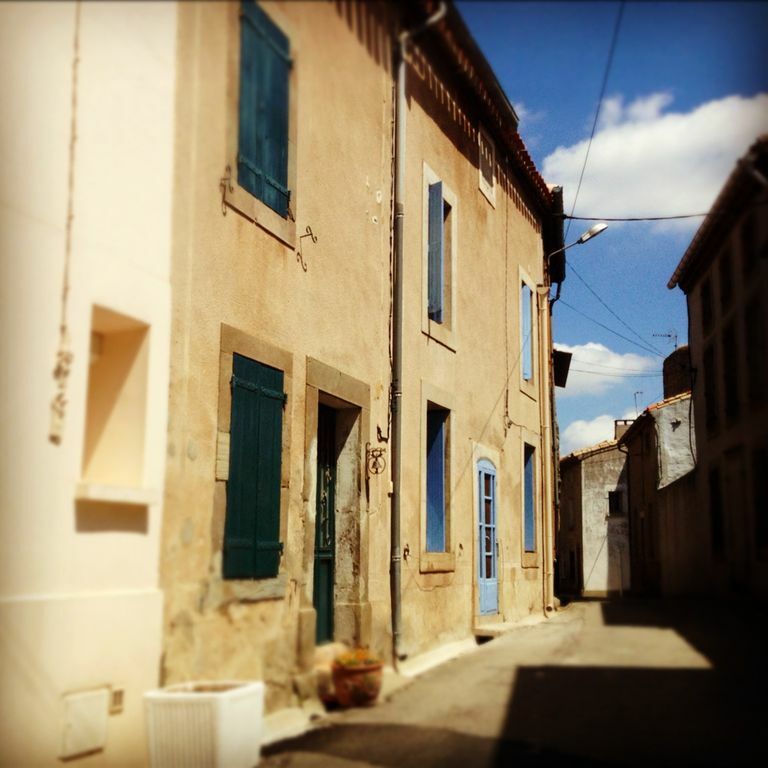 Castelnau-d'Aude, where this home is located, is almost equidistant between the larger towns of Carcassonne and Narbonne, and is the perfect central location for anyone wishing to visit the Languedoc-Roussillon region for its history, as well as its vineyards. Most of the notable historic villages, and the seaside, are within a reasonable driving distance from this home. The home was clean, comfortable, and stocked with all the necessary supplies, such as towels, linens, and cooking equipment. The local caretaker left us a friendly, welcoming note, which also advised us where to find the village market and the nearest wine tasting. Our handy Cadogan Guide book listed some fabulous restaurants that were only minutes away from the home. The home was especially great for us because we were traveling with children and were able to do laundry at the home. One piece of advice for prospective visitors, especially those who are flying in on a Sunday: be sure to visit a Super Marche early in the day (perhaps before 5pm), otherwise you may not be able to pick up provisions until the next morning. Bon voyage! We stayed here in August 2015 and had a very enjoyable stay. The house is well equipped with everything needed and the roof terrace was perfect for breakfast on those sunny mornings. There was plenty of literature showing the local tourist attractions. Castlenau is very well placed to visit the medieval city of Carcassone, whilst the sandy beaches of the Med are only 45 mins drive away. We also went on a boat on the Canal Du Midi, about 10 mins away. Definitely recommend this. We stayed in this house for the first time 11-23 July 2015, which was the third week of our 3-week vacation in France and Spain. It was a wonderful location to relax for the last week of our vacation. The house was spacious and well equipped, with all the comforts of home and very friendly neighbors. We will definitely stay again on our next visit to the area. After a 3.5 hour train trip from Bordeaux where we enjoyed a river cruise, we rented a car in Narbonne and drove about 40 minutes to Castelnau d'Aude via scenic country roads winding though vineyards, roman ruins, and fields of sunflowers. The house was a wonderful, central location from which to tour the area, which is rich in history, fine (and inexpensive) wine, beautiful and uncrowded beaches, castles and abbeys. We relaxed each evening on the terrance overlooking the town and surrounding vineyards. We highly recommend visiting the beach at Cap d'Agde, which is about a 70-minute drive, and the fortified city (Le Citi) in Carcasonne. The owner and the local managers arranged to have two bicycles in the house so we could enjoy riding along the Canal du Midi, which was about a 10 minute bike ride from the house - i was fun and very easy riding. We enjoyed rides on 3 mornings, watching the families waking up on canal boats and visitting numerous locks and small villages along the canal. Homps was a great spot to spend our last evening in the area, as we relaxed and watched people and canal boats from a small canal-side cafe. We stayed in this house on three occasions and really enjoyed our experience each time. This is a perfect base for exploring such a beautiful part of France. Located amidst vineyards and beautiful countryside it is a great way to relax and unwind. Having access to a car enabled us to visit many places. The local markets are well worth a visit. I would highly recommend a visit to the old town of Carcasonne and a trip on the canal du Midi. The beach at Narbonne is only a 45 minute drive from the house. There are also many other beaches in the surrounding areas. The house is comfortable and enables you to experience the true style of French living.